Before you say anything, your smile speaks about you. Your smile is one of the first things people notice and the last thing they forget about you. What does your smile say about you? Porcelain dental veneers can subtly or dramatically change your smile appeal. Veneers can instantly provide a striking, positive renovation of your smile and overall appearance of your face. In as little as two visits, you can say “good bye” to a smile that you may not be proud of. Porcelain dental veneers are thin, custom-sculpted shells, made of porcelain, that are handcrafted to fit over the visible part of your front teeth. We design each instance individually to match or enhance each patient’s smile. They are virtually undetectable. Placing custom veneers entails a high degree of technical skills as well as attention to aesthetic details. Dr. Malone has received extensive postgraduate training in cosmetic procedures at the renowned Las Vegas Institute. It is crucial to choose a right dentist who has special training and experience when you plan to get porcelain dental veneers. A skilled cosmetic dentist will ensure that your porcelain dental veneers enhance your smile in a beautifully natural looking way. With the right veneers, the shape, color, luster, and translucency of the porcelain will be indiscernible from natural, beautiful teeth. Your first step is to schedule a complimentary cosmetic consultation. All porcelain dental veneers are not created equal. The type of porcelain materials used to make veneers varies in strength and aesthetic properties. The degree of artistry also varies. As a result of these variables, some porcelain veneers appear more life-like than others. When natural beauty, realism, as well as strength and durability are a priority, then custom-designed veneers created by highly trained artisans are a must. These types of veneers can be designed as traditional-thickness veneers or as Ultra-Thin veneers, similar in thickness as a contact lens. The size, shape, and thickness of a veneer depend on what is being accomplished and what the existing conditions of the teeth are prior to treatment. Whatever the final design, this type of veneer is much more conservative in tooth enamel removal than a tooth prepared for a crown. “No-prep” or minimal preparation veneers are considered by a majority of cosmetic dentists who offer them as a viable alternative to traditional veneers for specific cases. Even though this type of veneer is very thin, in many cases the addition of any porcelain layer may result in bulkier looking teeth. If a person has under-size teeth or is young, the no-preparation approach may be appropriate. These types of veneers are marketed as “no-drill” and “no-shot” type of procedure. In select cases, this is true. It may be a good option for people who are seeking a noninvasive alternative to change the appearance of their smiles. 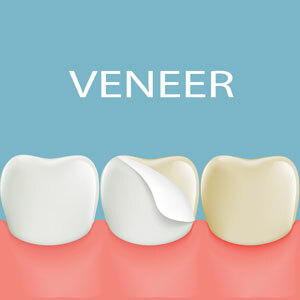 An example of these types of veneers is known as Lumineers®. However it is always our goal to minimize tooth preparation whenever possible where this is appropriate. Saving teeth and tooth structure is always our goal. Not all people are candidates for prep-less veneers, but they do offer an exciting alternative. Dr. Malone will conduct an examination and discuss your expectations, longterm smile goals, and budget to determine whether no-prep veneers or traditional porcelain dental veneers are the best treatment for your individual concerns. Smile more confidently! Turn back the clock! You can look 10 years younger in just two visits. Call us for a consultation appointment.